Adrenalin pumps through her veins as she pushes for the finish line, whether it’s competing for All American honors in the National Championships, or racing her friends on the playground back in elementary school. 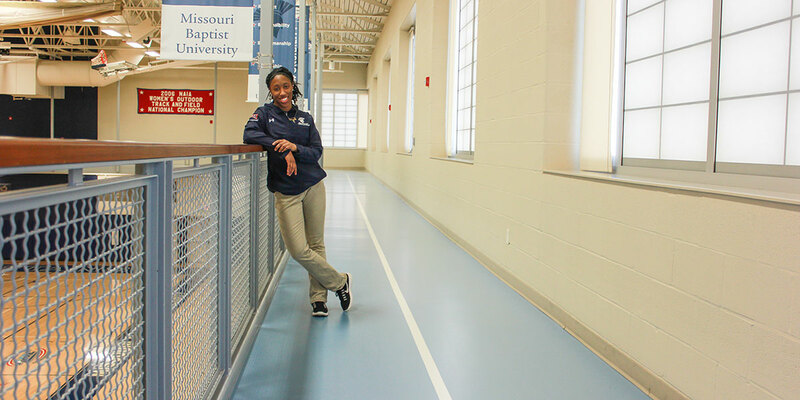 “Track has always been my thing,” said Aliyah Reams, 22, senior majoring in exercise science, and member of the MBU women’s track team. Reams, who grew up in Waukegan, Illinois, with her parents, twin brother and three other siblings, recently competed at Nationals and finished sixth in the 60-meter dash with a time of 7.76, earning All American honors. Her love for running sprints all started on the playground when she was in third grade. “In recess, I had a friend that would point to other kids and be like, ‘I bet you could beat him.’ She was like my manager. We’d race from the fence and back and then I’d be like ‘OK, who’s next?’” said Reams. After the early years of racing friends she joined the school track team. As a high school freshman, she raced on the varsity team at the same level as the seniors. MBU wasn’t her first choice for college, but when her other plans fell through, she made a visit to the campus and realized she appreciated the small feel the university offered. “I liked the small classes. I need small classes in order to stay focused and not zone out,” she said. Her first year at MBU was tough since she didn’t know many people and didn’t have the results she was looking for in the track season, but being the hard-working athlete that she is, she stuck it out. Reams joked that her mom always takes Nike’s slogan, “Just Do It,” literally when offering advice and, after hearing her say it over and over, it’s become something that she lives by. Even though Reams has always been close to her family, she rarely gets homesick because MBU has become a home away from home for her. “Some people get homesick that live like 20 or 30 minutes away but I don’t get homesick until it’s necessary, like when I need a break from school, period,” she said. The person who has influenced Reams the most during her time at MBU is athletic trainer, Ashley Broughton. Elizabeth Harris is photo editor and journalist for MBU Timeline. Harris is majoring in Communications with minors in Broadcast Media and Public Relations. Born and raised in Orange County, Virginia, Harris moved to St. Louis in the fall of 2013 to attend MBU. Harris enjoys spending her free time reading, doing yoga or anything outdoors.